There’s nothing quite like the right light to set the mood for the night ahead. Whether you’re intent on fishing, hosting festivities, a bit of romance, or simply showing some nautical style, LED (light-emitting diode) technology ensures today’s marine lighting options are endless. Errol Cain from Australian Marine Wholesale has been at the forefront of boating technology for almost 35 years. He says the advent of LED lighting has made a massive impact on all aspects of life including the marine market. “The first LEDs were red, and they got their start as indicator lights for circuit boards and small electrical equipment for this very reason,” he said. “But it didn’t take long for the possibilities of utilising them for boating to be realised. “As LEDs continued to be developed, the light levels increased to the extent that they could be considered for applications outside simple indicator lamps. In fact, by 1987, they were bright enough for the first applications within the automotive industry, where red LEDs were used for vehicle brake lights and traffic lights. The percentage increase in lux output of LEDs per generation since 2005. “I’m sure that the Generation 5 won’t be far away with the speed of today’s technology advancements,” says Errol Cain. Second-generation LED technology included the ability to string multiple LEDs into a single circuit. Over time, LEDs became more suitable for outdoor use. In 1993, Shuji Nakamura achieved a breakthrough in doping (the name for the process by which manufacturers introduce impurities in an LED to change its colour properties). This led to bright blue LEDs. As LEDs grew brighter, the flashlight industry switched to LEDs from incandescent lights. The new flashlights used less power and the bulbs never had to be replaced. Now it’s difficult to find a flashlight without LED bulbs. Which brings us to underwater lighting for boats today. “One of the very first companies to manufacture LED underwater lights for boats was Aqualuma LED Lighting based right here on the Gold Coast, founded in 2005 with the Generation 1, Series 3 underwater LED housed in a bullet-proof, polycarbonate housing. Today, Aqualuma is on to Generation 4 of underwater LED lighting with the Series 6, FF9, 12 and 18 products. Another major player in the LED field is Lumitec based in the US. “Since its founding in 2007, Lumitec has gone from a small start-up to a market-leading multinational LED lighting manufacturer. “Lumitec is an extreme environmental lighting company that offers solutions from leisure marine solutions through to commercial and first responder lighting solutions. 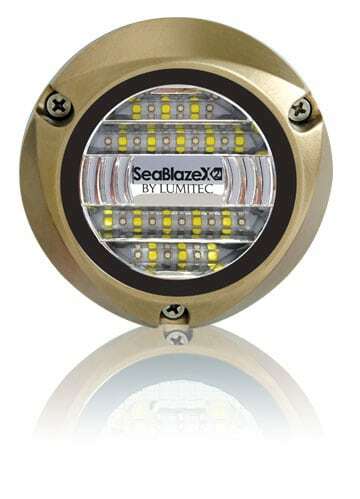 Lumitec also offers smaller vessel underwater lights as well as dock lights. The underwater lights are the SeaBlaze Mini, Zambezi mini, Zambezi Quattro, and SeaBlaze Quattro. The underwater dock light system is the Mantis kit comprising three lights and a control box in full-colour change. “With a dynamic range of light systems available, there is an LED for every purpose,” concluded Cain. This article was first published in the October-November issuue of Marine Business magazine.